THIS BOOK IS DESIGNED TO ASSIST SEA-GOING PERSONNEL IN THEIR UNDERSTANDING OF THE SAFE OPERATION, TESTING AND MAINTENANCE OF SHIPS ELECTRICAL EQUIPMENT AND SERVICES. THE PUBLICATION ALSO SUPPORTS A SERIES OF EIGHT FILM/VIDEO CASSETTES (WITH THE SAME CHAPTER TITLES) WHICH EXAMINE PRACTICAL ELECTRICAL MAINTENANCE AND FAULT-FINDING PROCEDURES ON BOARD VARIOUS SHIP TYPES. 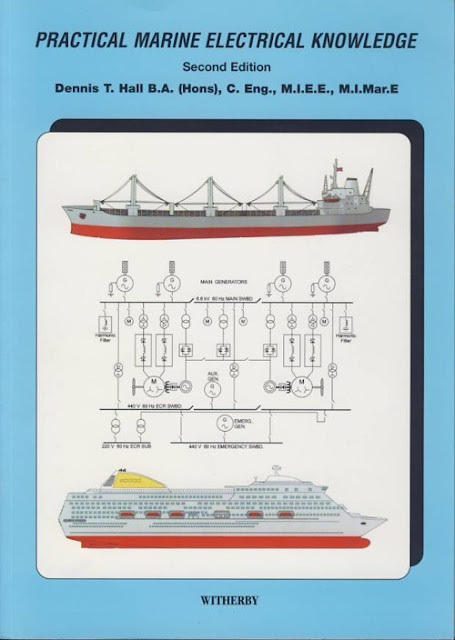 THIS BOOK DESCRIBES UP-TO-DATE ELECTRICAL PRACTICE EMPLOYED IN INTERNATIONAL SHIPPING. THE CHAPTERS HAVE THE SAME TITLES AS EIGHT ELECTRICAL TRAINING VIDEOS WITHIN A SERIES ALSO ENTITLED PRACTICAL MARINE ELECTRICAL KNOWLEDGE. THE CONTENT OF THE BOOK HAS BEEN DESIGNED TO BE COMPLETE IN ITSELF BUT IS ALSO ARRANGED TO GIVE TRAINING SUPPORT TO THE PRACTICAL VIDEO MATERIAL. IT HAS BEEN PARTICULARLY WRITTEN TO ASSIST MARINE ENGINEER AND ELECTRICAL OFFICER PERSONNEL IN THEIR UNDERSTANDING OF ELECTRICAL SYSTEMS, EQUIPMENT AND ITS MAINTENANCE. A SHIP'S ELECTRICAL POWER SYSTEM IS EXPLAINED IN TERMS OF ITS MAIN AND EMERGENCY GENERATION PLANT AND THE DISTRIBUTION NETWORK. ELECTRICAL SAFETY AND SAFE WORKING PRACTICE IS STRESSED THROUGHOUT. THE TYPES AND SIGNIFICANCE OF CIRCUIT FAULTS ARE EXAMINED TOGETHER WITH THE VARIOUS FORMS OF PROTECTION METHODS AND SWITCH-GEAR OPERATION. AN APPRECIATION OF GENERATOR CONSTRUCTION AND ITS CONTROL IS FOLLOWED BY A GUIDE TO ITS PROTECTION AND MAINTENANCE. MOTOR AND STARTER CONSTRUCTION, OPERATION AND PROTECTION ARE EXPLAINED. A SURVEY OF VARIABLE SPEED CONTROL METHODS FOR MOTORS APPLICABLE TO SHIPS IS ALSO INCLUDED. A WIDE RANGE OF ANCILLARY ELECTRICAL SERVICES FOR SHIPS LIGHTING, CATERING, REFRIGERATION, AIR-CONDITIONING, LAUNDRY EQUIPMENT AND CATHODIC PROTECTION ARE DESCRIBED TOGETHER WITH BATTERY SUPPORT, CARE AND MAINTENANCE. THE SPECIAL DESIGN AND MAINTENANCE FOR ELECTRICAL EQUIPMENT USED IN POTENTIALLY HAZARDOUS AREAS IS REVIEWED IN RELATION TO OIL, GAS AND CHEMICAL TANKERS. VARIOUS EXPLOSION-PROTECTED (EX) METHODS ARE OUTLINED ALONG WITH ELECTRICAL TESTING IN HAZARDOUS AREAS. SPECIFIC PARTS OF THE ELECTRICAL NETWORK TOGETHER WITH ITS CORRECT OPERATION AND SAFETY, INCLUDING UMS REQUIREMENTS, ARE EXAMINED IN RELATION TO THE STANDARDS TO BE MET FOR A SUCCESSFUL ELECTRICAL SURVEY BY A CLASSIFICATION SOCIETY. THE APPLICATION AND OPERATION OF ELECTRICAL PROPULSION FOR SHIPS IS EXPLAINED, TOGETHER WITH HIGH VOLTAGE PRACTICE, SAFETY PROCEDURES AND TESTING METHODS. DENNIS HALL HAS A LONG EXPERIENCE WITH THE MARINE INDUSTRY. HIS INITIAL TRAINING IN SHIPBUILDING WAS FOLLOWED BY PRACTICAL EXPERIENCE IN THE MERCHANT NAVY AS AN ELECTRICAL OFFICER. THIS WAS FOLLOWED BY DESIGN AND INSPECTION WORK FOR LARGE POWER INDUSTRIAL ELECTRICAL SYSTEMS AROUND THE WORLD. FURTHER EXPERIENCE AND KNOWLEDGE WAS ACQUIRED IN THE ROYAL NAVY WHERE HE WAS INTRODUCED TO THE REQUIREMENTS AND EFFECTIVE DELIVERY METHODS FOR THE TRAINING OF ENGINEERING PERSONNEL. AT SOUTH TYNESIDE COLLEGE, AS LECTURER AND MANAGER, HIS CUMULATIVE KNOWLEDGE HAS BEEN VERY USEFULLY APPLIED TO THE TRAINING OF MERCHANT NAVY ELECTRICAL AND ENGINEERING CANDIDATES FROM CADET TO SENIOR OFFICER LEVEL. AS HEAD OF ELECTRICAL POWER SYSTEMS AT THE COLLEGE, HE HAS EXAMINED MANY SHIP TYPES AND VISITED MANY MARINE COLLEGES IN EUROPE, USA AND JAPAN IN HIS DRIVE TO MEET THE TRAINING AND EDUCATION NEEDS OF THE MARINE INDUSTRY.